Stepper motors are everywhere! They’re pretty easy to find in old abandoned printers. They come in a variety of configurations and number of poles but they all make great electrical generators! Any electric motor will also output a voltage when it’s freely spinning. Stepper motors are much better at this because they have many times more poles to pass next to each other thus generating electrical pulses. These pulses are actually AC voltage that can be used to directly drive LEDs. I’ve experimented with different LEDs connected in this way on my bike light stepper generator and none of them have burned out yet. This AC voltage can also be rectified and converted to a DC voltage with the addition of a simple full bridge rectifier explained below. 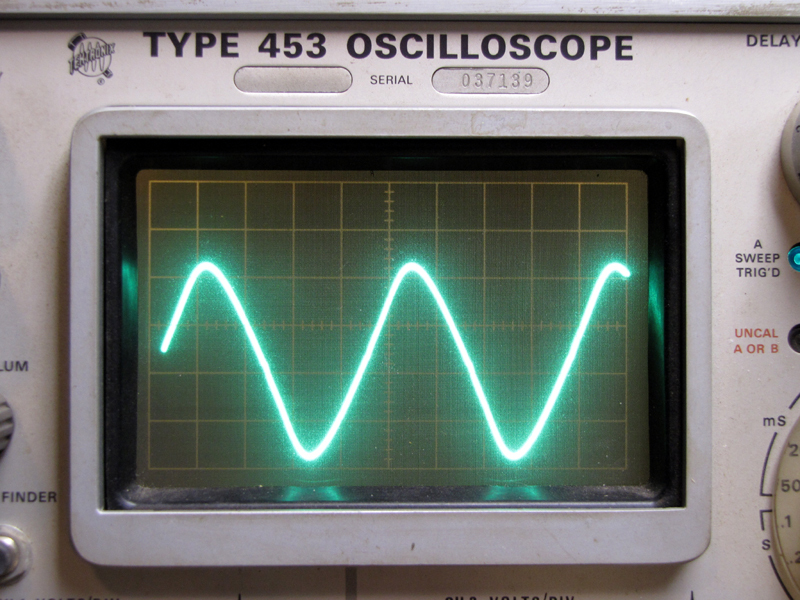 Below is a full wave rectifier circuit. 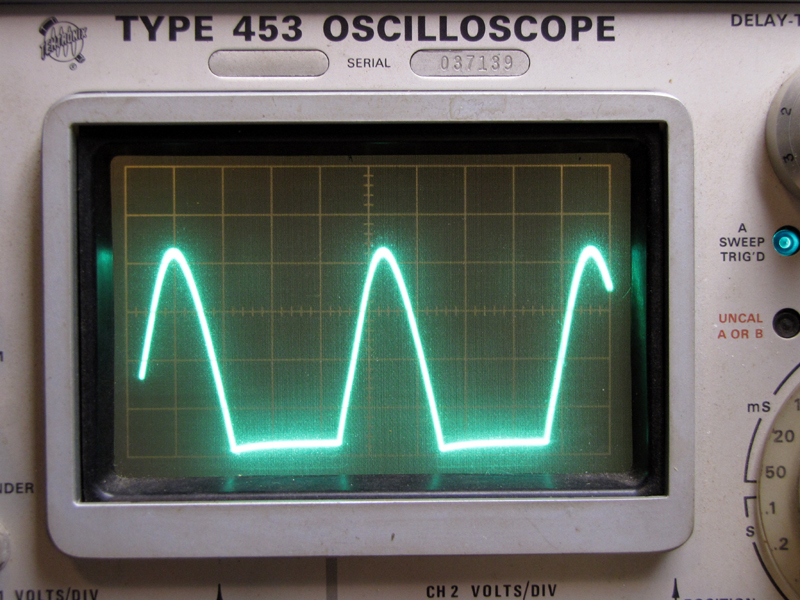 The stepper motor produces a sine wave whose polarity (positive or negative) changes sign each half cycle. 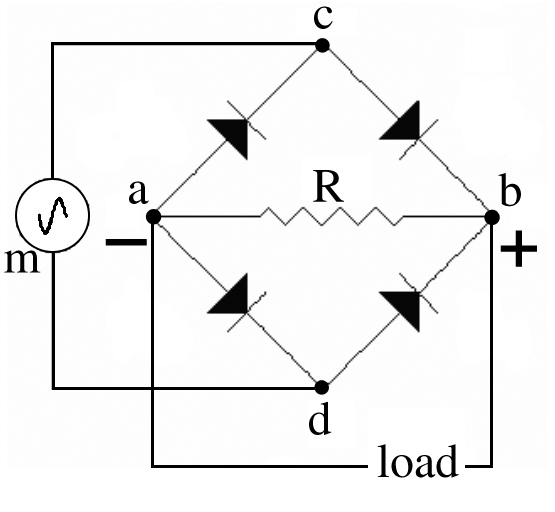 When the direction of the current is from the generator into the bridge at point c, the only available current path through the bridge is cbad, through the resistor from right to left in the diagram. During the next half cycle, the current direction is from the generator into the bridge at point d. Then the only available path is dbac, but again the current direction is from right to left through the resistor. 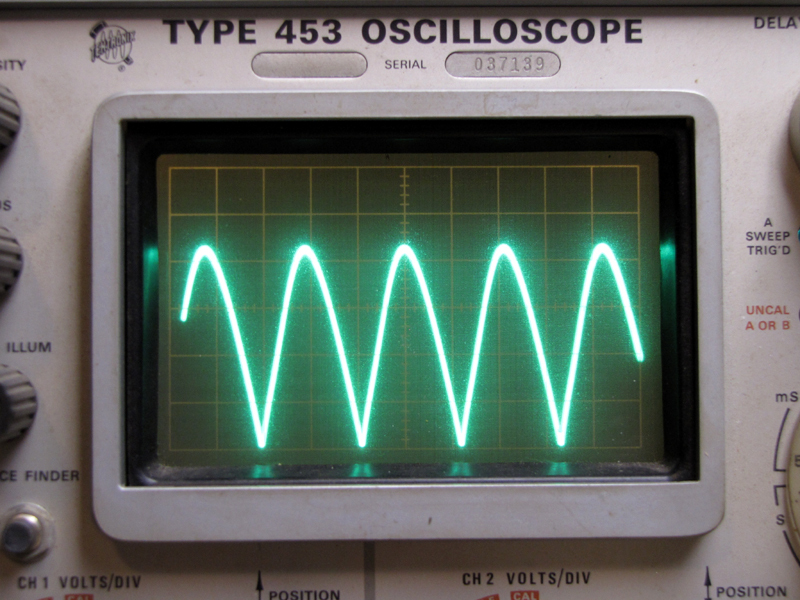 Therefore the current through the resistor always has the same direction. As shown in the video below, this rectified DC voltage can be very useful as a power source for LED lights or charging small batteries. This motor had a peak output of 43 volts at .41 mA. 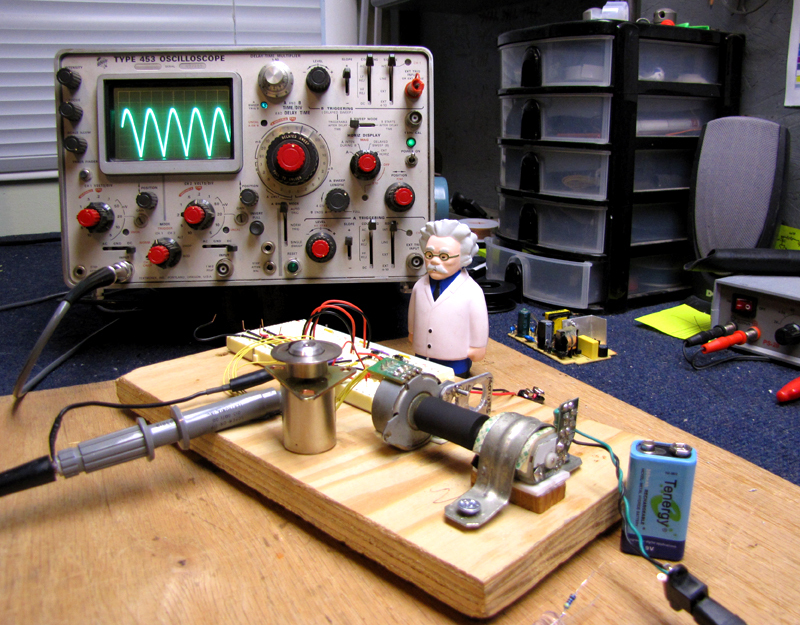 Stepper motors are awesome hackable items and they’re easy to come by. 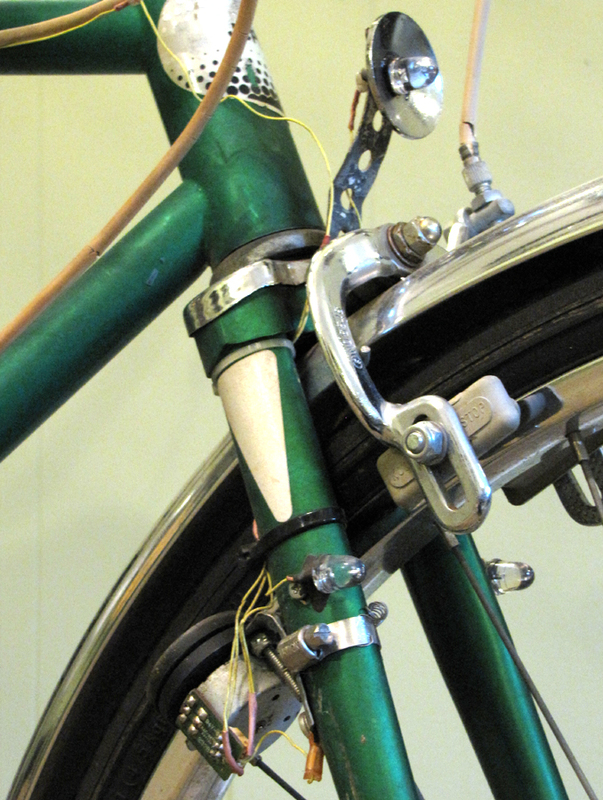 Think of all the ways you can get a motor to spin from salvaged energy. If something is moving, that motion can be converted into motion of the stepper and used to generate electricity. Wind, water, wheels, drive belts, hand cranks, treadmills. Let your imagination invent a way! I encourage you to try building this experiment platform and then seeing how you can salvage electricity from your environment with a stepper motor! I’ve been looking for this one for months. generator. (not much good) maybe 1/4 Volt. drives apart for the motors. But don’t too much about running the motors. wire HD motor might be helpful. and a simple controller. Is there an easy way (a topic for a hack, perhaps!) to find out when the battery’s fully re-charged? And is it possible to damage the battery by continuing after it’s fully charged? Glad you’re enjoying the projects! Most battery chargers have a charge controller circuit that cut’s off the supply when the battery reaches a certain voltage or temperature. They WILL get hot when fast charging and over charging can harm the battery. LIPO batteries can even explode if over charged. A charge controller circuit would indeed be a good hack to post. I’ll look into that one. As a battery is charging, its terminal voltage increases. When it is fully charged, its voltage will stop increasing, and with some types will fall slightly. Better chargers therefore have a “zero delta V” and/or “negative delta V” detector to stop charging when the battery is fully charged. Some types of battery will not be damaged by a reduced (small) charge rate when fully charged. This is useful for batteries that are left on charge until required. The Kaba Mas X-90 digital safe lock (http://www.kaba-mas.com/Kaba-Brand/Products/366458/x-09.html) uses a small generator inside to create the power for the microcontroller and LCD display. I’m wondering if you could use a stepper motor to do the same? Big caps to store the power? Would you need a regulator to feed the 5V for the ucontroller? Could you *also* use the stepper at the same time to detect turns of the dial I wonder?